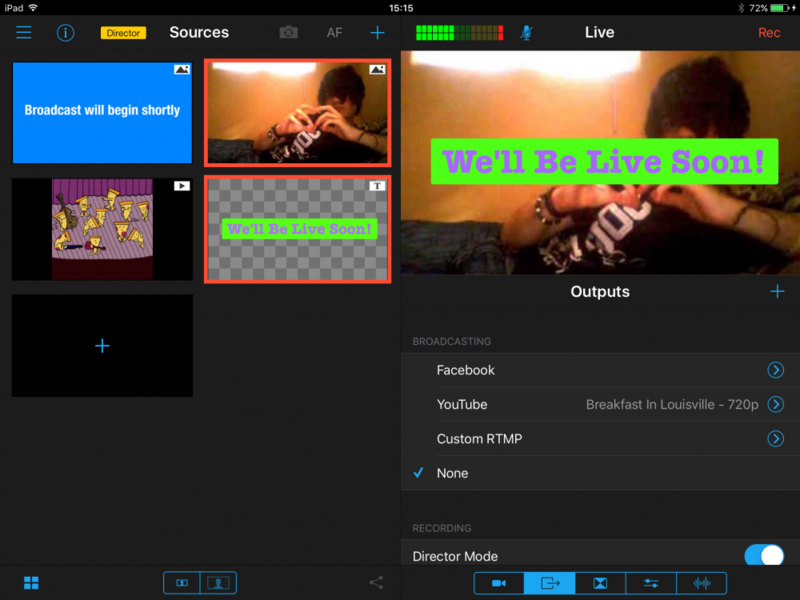 One of the easiest ways to add a professional touch to your live videos is by using overlays, including lower-thirds, logos, and full-screen graphics. 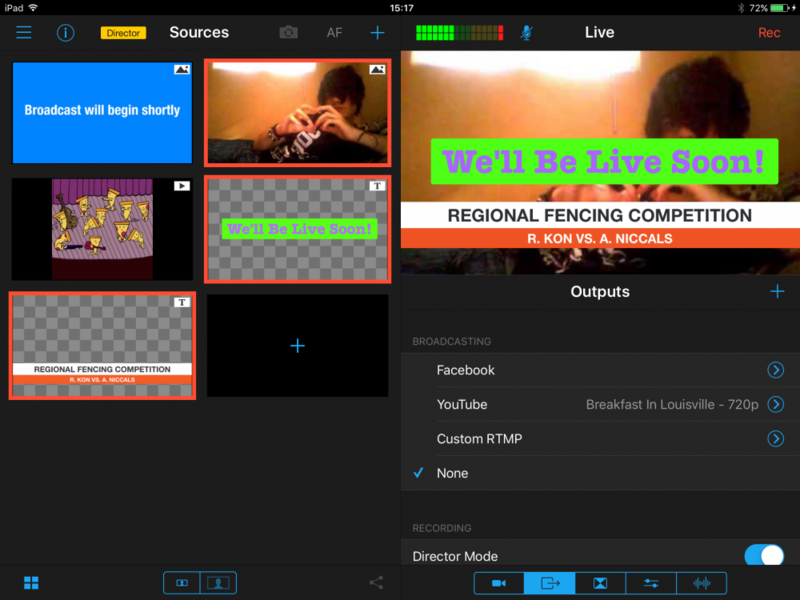 While you can create your own graphics and import them into Switcher Studio as seen in this tutorial, there are many users who may prefer in-app graphics creation. 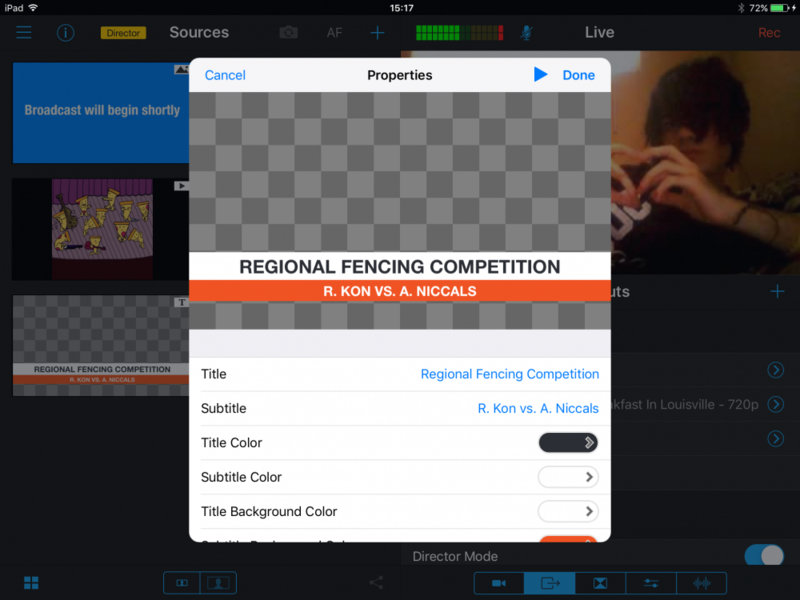 To create graphics from within the app, click on the black box with the blue "+" in it, which is located at the bottom of the Sources Window. This is the same place that you go to import pre-made graphics or other camera sources. The Assets Window will appear. The third section down is for "Dynamic Templates". This is where we want to be. Let's explore "Titles" first. If you select "Full Screen Text", you will be able to create your own custom text with a solid-coloured background behind it. 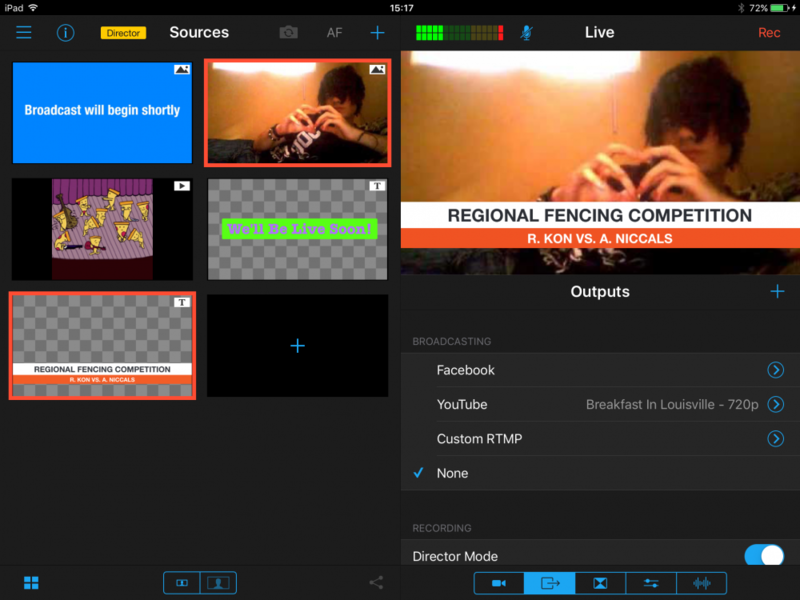 This is similar to the "Broadcast will begin shortly" image visible in the Sources Window in these example images. "Text Overlay" also allows you to create your own custom text, but with a small, coloured banner behind it. Let's select this option. Type the text that you wish for the overlay to include. 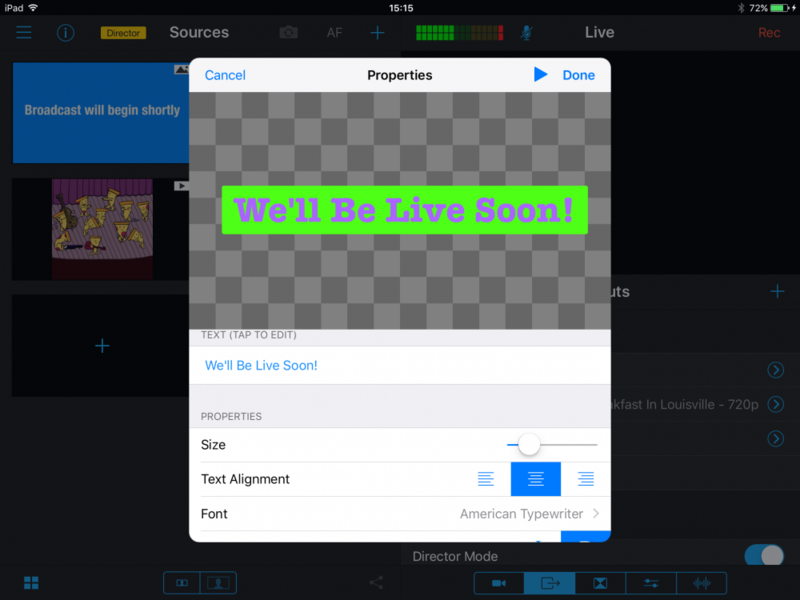 You can then use the properties to adjust the size, font style, text colour, background colour, position, and more. When you are finished, tap "Done" from the top-right corner. Your new text overlay will now appear as an option in the Sources Window. Tap on it to make it Live for your audience. 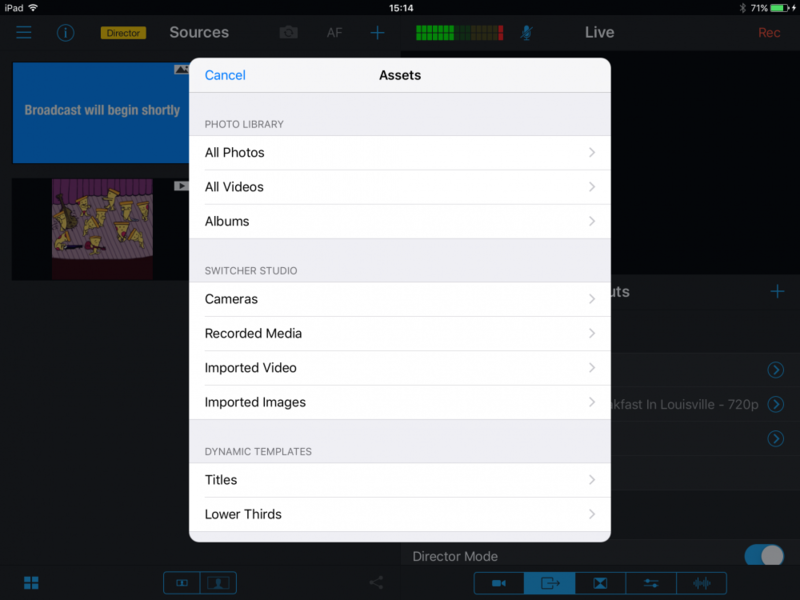 From the initial "Assets" menu in the second image, you can also select "Lower Thirds" instead of "Titles". This will take you to the "Dynamic Lower Thirds" menu. As the name suggests, these Dynamic Lower Thirds feature animated text that can take your broadcast to the next level. You can set these graphics up using the same methods demonstrated in the earlier example. Enter in the text that you want, and select your desired colour scheme. When you are finished, tap "Done" from the top-left corner. 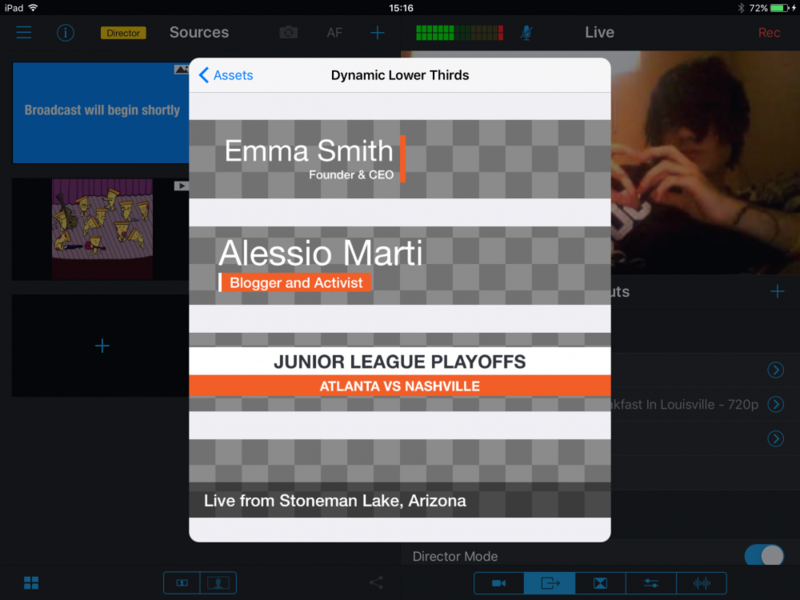 Tap on this new dynamic lower-third, and it will appear across your screen with the animation intact. 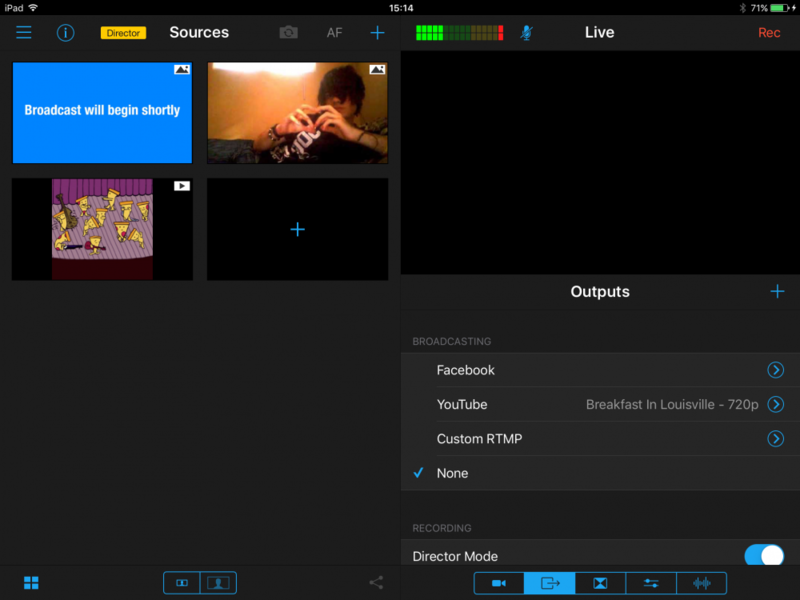 It is now ready to be used in your broadcasts. Just as with your normal imported graphics, you can also layer these live text graphics on your screen, to demonstrate multiple graphics at a time.